I want to spend the next few weeks talking about strategy. We often have the entirely wrong idea about what strategy is and how we pull one together. Over the next few weeks, I want to challenge some of our biggest assumptions about strategy. Today I’m going to share one of the most useful community building resources we use. It’s based on an old business framework called Ansoff’s Matrix. You should never try to target your entire community with any activity. The needs of each group vary considerably. You should instead target the group that is most likely to drive the kind of behavior you need (check the 3rd column of this table to understand what behavior is valuable). Once you know the behavior, you can decide which audience can most increase the quantity of that behavior in your community. This feeds into some natural strategies as you see below. This means every strategy should be based on these specific questions. 1) Is it easier to get existing members to perform more of the behavior (easy unless they are participating as much as they can)? 2) Is it easier to get existing members who don’t perform their behavior to do it (ideal if they are easy to persuade)? 3) Is it easier to get new people who perform the behavior elsewhere to do it in your community? (often easier than persuasion). 4) If these don’t seem especially easy, you need to reconceptualize your entire community. Your answers to these questions will play a critical role in your strategy. Imagine you want to increase the quantity of useful knowledge shared about your sector. You could target top members who already share knowledge to do more of it (perhaps via a reward program or habit-building process). You could target regular members to improve the quality of knowledge they share (perhaps with training, newsletters, and other content). You could target people who already share great knowledge to join your community and do it there (perhaps via a growth strategy). There are three very different audiences and three very different strategies. Before you do anything else today, decide which of the four quadrants you’re working on. 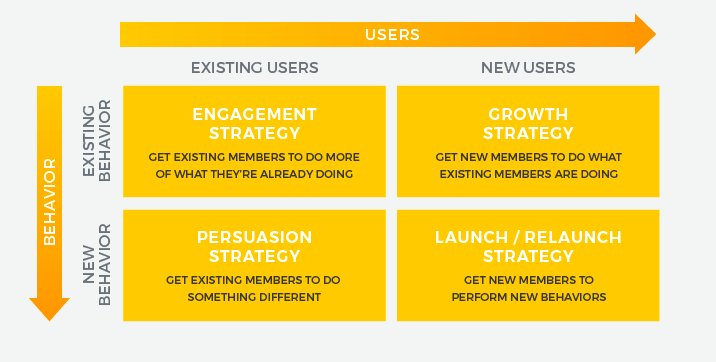 Do you want existing members to do more of what they’re doing? Do something new? Or do you want new members? The strategy for each of these will be very different. Once you have your answer, it becomes a lot easier to identify the kind of tactics you need. p.s. This material is taken from our upcoming Strategic Community Management program. We’re going to train a group of passionate community managers to rethink their work and take a strategic approach to everything they do. Registration will open in two weeks.